zarinahtakesapaycut: Malaysian Media to be there at PwC Malaysia's court date? Malaysian Media to be there at PwC Malaysia's court date? "I just want to say one sentence. This is the most humble day of my life." - Rupert Murdoch's opening remarks. 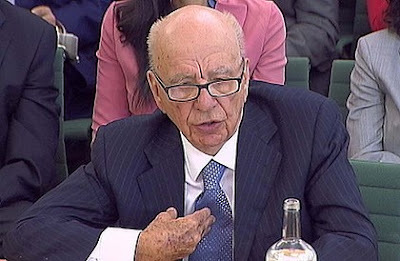 When a billionaire like Mr Rupert Murdoch can say that he has been humbled because of acts that took place without his knowledge, and goes on to do what is right by shutting down the 'News of The World' tabloid, we have to wonder if we will ever practice the same level of accountability and responsibility in Malaysia. "We felt ashamed at what happened. We had broken our trust with our readers." - Rupert Murdoch explains why the News of the World tabloid was shut down after 168 years. We would like the Malaysian media to make a phone call or two to the Directors of PwC Malaysia, and get the next trial dates for any civil suits that PwC Malaysia is facing in the High Court. The country is moving towards a new paradigm which values transparency, accountability and responsibility over the old way of doing things. The media, as the fourth estate, is meant to act as a guardian of the public interest, and keeping this in mind, the media should attend the hearings involving the largest audit firm in the country, so that the public can be made aware of what is right, and what is wrong. All the journalists will have to do is attend the hearings, and discern for themselves from the testimonies of the witnesses, some of whom will be from PwC Malaysia, on whether the interests of the Malaysian Public is being well taken care of when one firm or another is entrusted with jobs involving the GLC's and other PIE's. If the media finds that there are further questions that must be answered by the auditing fraternity on the standards employed in Malaysia, then they should ask them at the right time and opportunity. But if the media decide to shirk their responsibility and ignore the questions raised not just here, but in many other sites in the world wide web, then we might have to accept that the Malaysian Public will be better off relying on the alternative media to safeguard their interests; not because the mainstream media is not capable, but because they just do not care enough. The mainstream media are entrusted with an unenviable task of not just being a watchdog on the activities of those in power, or aspiring to power, but also those that play important roles one step away from the corridors of power. And not many firms play as important a role as PwC Malaysia does when we consider the hundreds of billions of the people's money at play in the client list of PwC Malaysia. Quis Custodiet Ipsos Custodes? Who guards the guardians........ of public money? If not the media, where else can we turn?